We don't seem to have a lot of wall space in our new home, so adding art or especially big pieces has been a bit of a challenge. I really didn't want to do away with this clock, so I was determined to find a home for it. Now it had to be some place where I could put a big bolt in a stud so it wouldn't fall down. This is a clock that my Uncle Tom (mom's brother) took out of the old school building in California when it was being torn down. He stripped all the weird green color paint off of it and totally restored it. When he passed away it went to my mom and when she went to heaven I got it. I love this clock, so different. Here is a picture I found online and the description of this clock. Master clock from the old Banning, California High School building. It's not always easy to find one of these clocks just as it was originally made. This example dates from around 1915, but it appears that the program movement and bell relays are of a later vintage. In other words, it was "upgraded", probably to automatic reset, during the 1930's or later. The only place we could find to hang it was here in the loft. I love how it turned out, and the clock is fine in the corner. To balance things out I added two paintings above the bookcase in my desk area. Last week I shared the loft and my office space over at The Uptown Acorn. Ron has a fabulous series called Things That Make Me Happy, and I was delighted to be invited to participate. If you missed it this is what I shared on that post, but the clock and paintings have been added since then. I have never had a dedicated "Office" space before. In our previous home I used the buffet in the breakfast area as my desk and office. It worked out well and allowed me to be in the center of the action. This new house had a super bonus space that I adopted as my little nook. The Loft. 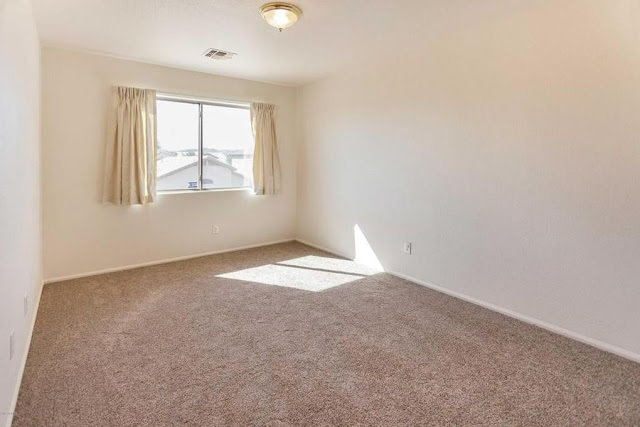 Let's take a look at this space from the listing pictures. 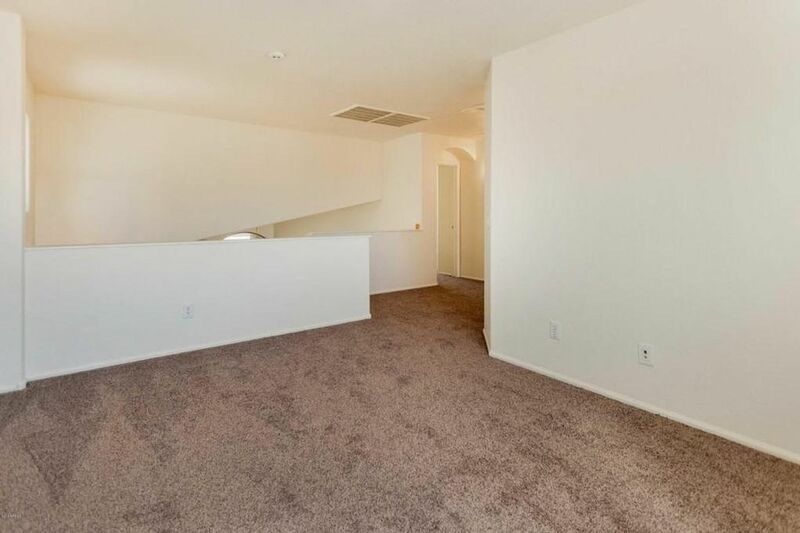 A nice size space that is right at the top of the stairs. Simple empty space with no frills or anything I have to work around. This is a bonus spot for sure. I have sort of adopted this as my space. It is the perfect place to get away and blog or to sit and watch a favorite TV program. Instead of a "man cave" I have a "girl cave". I didn't have a desk so I thought I would use this gateleg table as a large workspace while I looked for a desk. However, I am loving it so much that I don't think I want a desk. I love how it looks and the space is perfect. Since this room sort of got all the leftover pieces of furniture that didn't fit anywhere else, I borrowed this small bookcase from my hubby's office and it holds all the things I need to have at hand when I am working at my desk. (I do have other office storage elsewhere). The wicker chair was in the family room of our previous home and the settee was in our bedroom. Both are perfect to create a nice seating arrangement in this space. The drapes were a pair that I had packed away. They were in the master bedroom about 2 makeovers ago. Perfect color for here and all I had to do was cut them off about a foot and re-hem. You can see how different things look now with the clock and paintings and I think they are perfect additions to this area. In the mirror you can get a glimpse of the entertainment center across from the settee. Standing on the stairs peeking over the railing. You can see the whole room a little better. The entertainment center was in the family room of our previous homes, but it didn't work in this family room, so it made it to the loft. I have extra office storage with these drawers and door storage, plus a TV behind the center doors. I love the loft and it is definitely one of my favorite places. Definitely one of "My Happy Places". This room came together for "free". Just all the pieces that didn't fit anywhere else and they seem to be perfect for here. Be sure to check out this on-going series at The Uptown Acorn to see all the other participants each week. That clock is fascinating and looks great in your "girl cave." Your loft is one more area where you've created a warm and inviting arrangement of furnishings. It looks like a great spot for blogging, reading, or watching TV. I love the history of your clock. It looks perfect there. We also have a gigantic antique clock, called a comptoise. It was hard to find a spot for it where it wouldn't get bumped into. Your loft space turned out amazing!!! I love the clock, what a great piece and I love the history behind it. I'm jealous of your amazing loft office - it's so cozy, and just perfect for blogging! the clock and paintings look great, I can't believe how quickly you are settling into your new home - I've been in my 'new' home for nearly two years and I'm still settling in! Looks great. I know what you mean about a lack of wall space because my home has arches. A niche in the bedroom broke up a wall space also. However, I love the plant shelves in this home. I think the clock looks great there. So nice to have a "girl cave!" Such a lovely clock and it looks great where you have it. Your room is so nice and comfortable. Now you have your own cave and everything looks great together. Great job Marty. Oh my gosh Marty what a great treasure clock you have. Love the history and the uniqueness to this clock. It looks so great where you hung it. I am swooning over this clock I would love a clock like this. Beautiful. What a wonderful family treasure to have and I love where you have showcased it! That is such a pretty clock with a wonderful story behind it! I think it looks perfect where you used it. It balances out the pictures on the opposite side too. That loft is great! It makes a great tv viewing room and office. I like the gate leg table being used as a desk too. Marty, you have done such a wonderful job decorating your office. It looks beautiful! I adore clocks, and yours is a treasure. I love where you placed it. It is perfect! I hope that you enjoy your day and that you have a wonderful weekend!!! I love this room! The clock is a beautiful addition to this lovely space! I really loved the way you put the things in an organized manner for Home Decor. Thanks for being an inspiration for others. Love your "Girl Cave"! What a wonderful spot for all that you do. And that clock--oh, Marty, what a wonderful clock!! I don't remember it from your other home--did you just recently get it? It's beautiful, and you've chosen a great spot for it. Everything in this house is shaping up so beautifully. I'm so happy for you!